The majority of the conversation about global or regional temperature involves discussion about how the average annual or monthly temperature has changed over time. However, for many organisms it is actually the range of temperatures they experience throughout the day (the diurnal temperature cycle or DTC) and throughout the year (the annual temperature cycle or ATC) that is most important in terms of biological processes, phenology, and other ecological interactions. Think, for example, about any forest pest that is a concern in your region – chances are its population is significantly affected by the magnitude of temperature ranges from summer to winter and from night to day. In this bulletin, we will explore this topic further and highlight a recent analysis that sheds new light on global temperature trends during the period 1975-2013. Before we delve into the recent research, let’s take a moment to discuss how daily and annual temperature ranges have historically varied across the globe. The range of temperatures experienced over a given year, or the annual temperature cycle (ATC), is generally larger in higher latitudes because winters are so much colder in those areas, compared to the tropics. Therefore, ATC increases as you move from the equator to the poles (Figure 1). In contrast, the daily temperature cycle (DTC) is typically much larger in tropical regions than in higher latitudes because there is more intense solar heating during the day in the tropics. 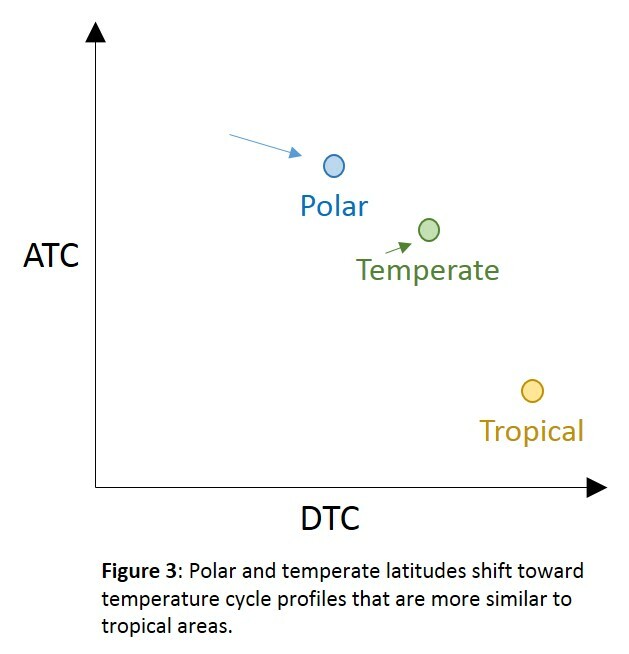 This means that DTC generally decreases as you move from the equator toward the poles (as you can see in this map—Bonebrake & Deustch 2012, Figure D1). 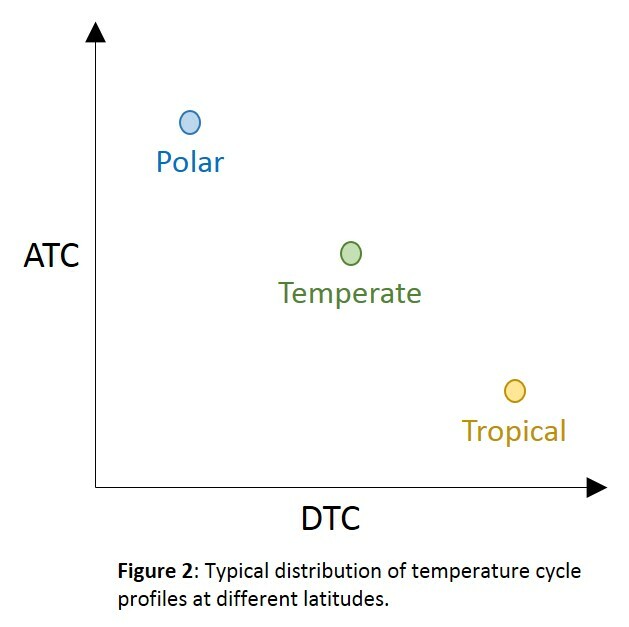 The combination of DTC and ATC gives each latitude a unique temperature cycle profile (Figure 2). 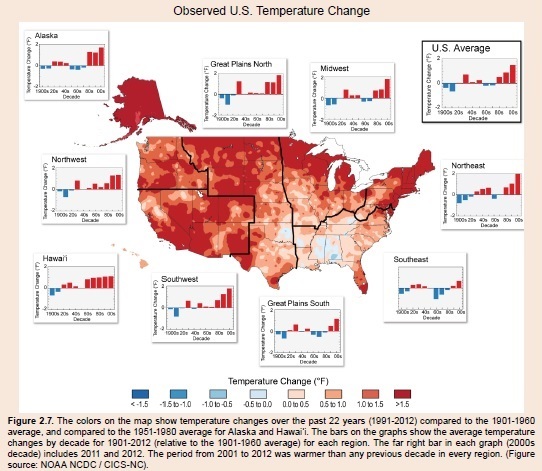 So what did the researchers find out about how these temperature profiles have changes in recent decades? In a study published in the journal Nature Climate Change (Wang and Dillon 2014), researchers estimated the diurnal (i.e., daily) and annual temperature cycles (DTC and ATC) from 1975 to 2013 by analyzing 1.4 billion hourly temperature measurements from over 7,900 weather stations around the globe. (1) There has been a global increase in DTC since 1975, and this effect was stronger at higher latitudes. This effect was also stronger at higher latitudes. (3) Altogether, these changes indicate that the temperature cycles of high latitude climates are becoming more like the tropics (a phenomenon the researchers call a ‘flattening’ of the global temperature profile) (Figure 3). The observation that there has been an increase in the magnitude of the daily temperature cycle, is particularly interesting because it differs from previous research. The last global analysis of daily temperature range was done almost ten years ago and most of the subsequent regional studies have suggested that the daily temperature range has either decreased or remained mostly unchanged (IPCC 2013). However, this study is data-rich, global in scope, and it employs a new statistical approach. 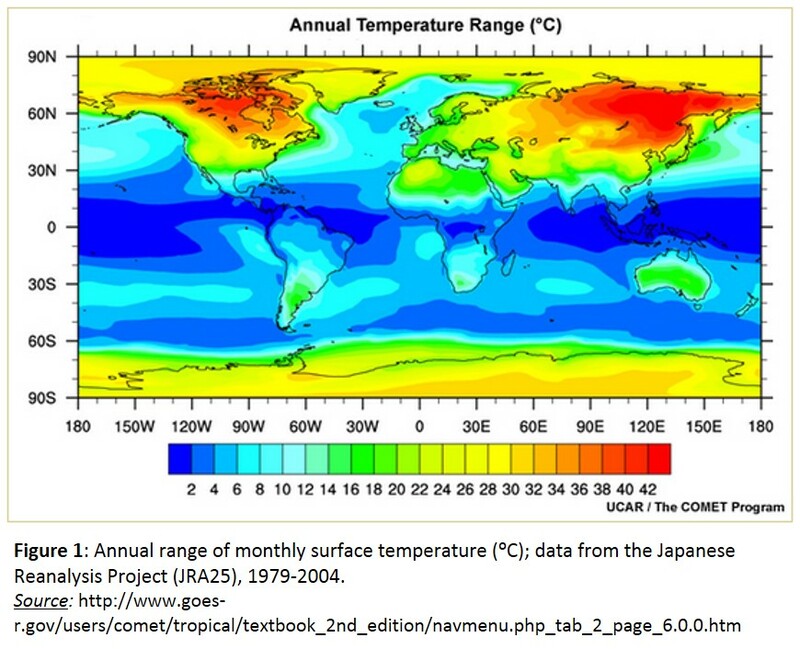 Many of the techniques commonly used for this type of analysis require regularly sampled data, which forces researchers to average their temperature records over a particular time window, such as a monthly average. That may be fine for certain types of research questions, but it can also ‘smooth over’ changes that may be happening on the timescales that are most relevant to organisms. The type of analysis used here does not require that kind of data selection or aggregation, so they were able to capture more of the biologically-relevant temperature changes. The observed changes in the range of daily and annual temperatures will have important consequences for many species. In particular, short-lived organisms, such as the mountain pine beetle, have already benefited from increased winter temperatures that have allowed their populations to increase. Organisms adapted to a larger range of temperatures may fare better under conditions where the DTC is increasing, as opposed to more specialized organisms that can only survive or reproduce within a narrow temperature range. 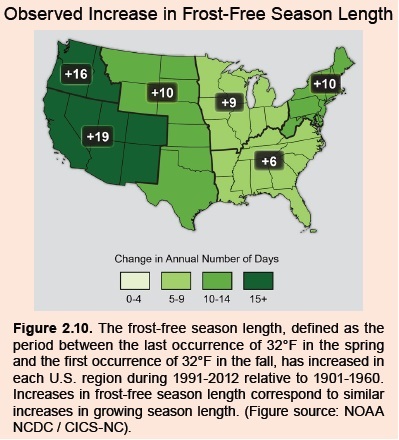 Also, in places where the daily and annual temperature ranges are becoming more similar (as they are in the tropics), we may see seasonal organisms that can now persist throughout the year. The most immediate concern for forest managers will be the effect of these changes on the life cycle and population dynamics of various pests and diseases. The researchers in this study primarily focused on what has happened with regard to temperature cycles, rather than why those changes may have happened. Other studies suggest that changes in the level of solar radiation reaching earth’s surface (resulting from factors such as pollution in the atmosphere and cloud patterns) are a big piece of the DTC puzzle. In fact, clouds have a particularly large influence on daytime temperatures, but cloud patterns are difficult to model, which is why they are an important area of uncertainty that explains why most models do not agree on future projections of DTC (Lobell et al. 2007). At the same time, cloud cover is an example of an atmospheric feedback that is influenced by the backdrop of a warming planet. These kinds of complex interactions illustrate why it is challenging to determine the role global warming will play in influencing existing climate dynamics. Climate is a broad and dynamic subject, with new research and refinements to our understanding emerging every week. 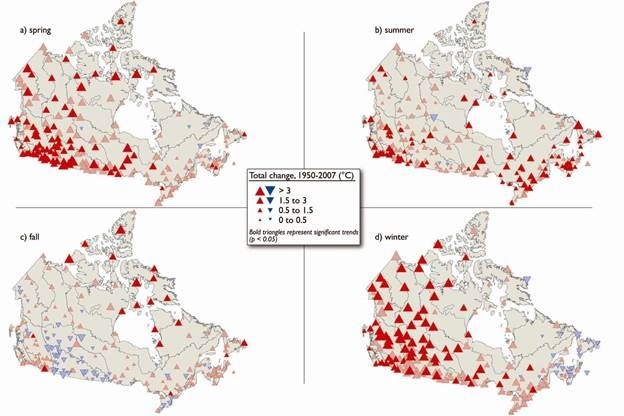 The potential for change in temperature variability is one of questions that will be particularly important because of its ecological implications. This studies raises a number of important questions on this subject and we will be sure to keep you informed as the science evolves. Hartmann, D.L., A.M.G. Klein Tank, M. Rusticucci, L.V. Alexander, S. Brönnimann, Y. Charabi, F.J. Dentener, E.J. Dlugokencky, D.R. Easterling, A. Kaplan, B.J. Soden, P.W. Thorne, M. Wild and P.M. Zhai, 2013: Observations: Atmosphere and Surface, Section 2.4.1.2 Diurnal Temperature Range (p. 188). In: Climate Change 2013: The Physical Science Basis. Contribution of Working Group I to the Fifth Assessment Report of the Intergovernmental Panel on Climate Change [Stocker, T.F., D. Qin, G.-K. Plattner, M. Tignor, S.K. Allen, J. Boschung, A. Nauels, Y. Xia, V. Bex and P.M. Midgley (eds.)]. Cambridge University Press, Cambridge, United Kingdom and New York, NY, USA. Lobell, D., Bonfils, C., and Duffy, P. 2007. Climate change uncertainty for daily minimum and maximum temperatures: A model inter-comparison. Geophys. Res. Lett. 34(5). DOI:10.1029/2006GL028726. Wang, G. and Dillon, M. 2014. Recent geographic convergence in diurnal and annual temperature cycling flattens global thermal profiles. Nature Climate Change. 4(11): 988-992. This CSLN Bulletin provides a synopsis of management actions that can be employed to maximize the resiliency of forest stands to damage by wind, ice and heavy snow. The goal is the development of forest stands and trees that can withstand 70 MPH wind gusts. Part One of this Bulletin provides background on windfirmness. The best way to promote wind firmness is to reduce stocking levels. Lower-stocked stands have less standing inventory at risk, as well as bigger trees that add more value and are more efficient to harvest. The open quality of these stands also allows for more air movement, which creates a drier environment, so there is less fungal growth; interrupted small insect movement, such as bark beetle flight; and better conditions for birds to hunt insects. Thinning is a better tool for building wind firmness in young stands, but it is possible to increase windfirmness in older stands if it is done very carefully. Below are more detailed summaries of what to consider when thinning stands of different ages. This develops more drought resistant trees and increases the economic value of residual trees through better trunk growth caused by swaying (See Part 1- How Trees Grow and Respond to Physical Stresses). Young stands that are thinned have a much better chance of developing windfirmness than older stands. This is another reason to start new cohorts of trees across the ownership, so they can be thinned for greater windfirmness. Put your efforts on deeper, better drained sites. Shallow rooted or frequently saturated sites are poor candidates for thinning to develop windfirmness. On these sites, dense stands managed on an even-aged basis are probably a better way to reduce risk. Wet soils are weaker at holding roots, even if it is deep soil. Thus, soils that are saturated and unfrozen for longer periods of time are likely to have more blowdown. Remove suppressed and intermediate trees that are the same age as overstory trees. Trees in the upper canopy are already expressing both wind firmness and good growth. Maintain high crown ratios. Conventional wisdom was that 30% crown was sufficient, new wisdom is that ratios in the 50% range are preferred. Space residual trees so that the crowns have space to sway some, but also have some support from neighboring trees near the likely limit of “sway stability”. Sufficient spacing allows swaying that causes trees to increase diameter growth in those parts of the trunk where the stress of that movement occurs. The trick is to manage it so most of that growth occurs on the commercially valuable section of the tree. This will vary by species, site, and tree form. It is difficult and risky to develop a truly windfirm stand when starting with an unmanaged, middle-aged forest. Working with forests in this condition is likely to be disappointing because you cannot simply do a typical partial harvest and have a guaranteed increase in windfirmness. Forests that have been managed are better candidates for windfirmness development, but they also present their own set of challenges. These stands may have had a series of partial harvests over time and thus have a variety of age classes. The classic “uneven-aged” forest is really a forest with several individual age cohorts. Managing these for windfirmness, or any other purpose, requires knowing which age cohort the trees you are managing fall into. Treat the old trees, intermediates, and young trees appropriately to each development stage. Crown shape and bark character are normally good ways to identify age. Despite the challenges, there are a number of thinning practices that can result in significant benefits to windfirmness and other forest values. Thinning also increases the economic value of residual trees through better trunk growth caused by swaying (See Part 1- How Trees Grow and Respond to Physical Stresses). The spatial structure of the forest canopy can affect wind dynamics. In particular, dense crowns create a smoother surface and deflect wind as a continuous front. Wind flows up and over this tree front and then curls into a roll. Significant damage often starts 2 to 3 tree heights back from the edge, where this roll comes back into the crowns. Understory growth, regeneration, shrubs etc, do absorb some of the stress of wind, as well as provide habitat for more bird species, which prey on insects. Trees growing at the edge of a forest. These individuals are more windfirm, having grown in windier conditions. Be very cautious about thinning these and disrupting their unified front. The stand edge perpendicular to the prevailing wind. Suppressed and intermediate trees under chosen crop trees. Patches of trees between chosen crop trees that are not competing with crop tree crowns. Species either prone to blow down or to develop internal decay. Less windfirm or more rot likely species from the list below. Trees competing with crowns of chosen crop trees. Remove trees whose crowns touch the crop tree crown. The desired outcome is more space for the crop tree crown to sway, but at the limit of that sway to meet a neighboring tree crown and get some support. This increased but limited sway space will result in the crop tree becoming more wind resistant and adding value through stem thickening in response to the added stress of swaying. Note: In even-aged stands of spruce/fir, harvesting in patches results in less wind damage than uniform thinning. Recently thinned stands are more vulnerable to wind and ice damage. It takes time for the residual trees to develop the extended root systems and the stronger, more tapered stems needed to withstand the increased motion cause by more wind within the stand. The commonly expressed time is five to ten years, but there is little research to back this up. There is a difference in susceptibility between recently thinned and un-thinned stands, but it is not a very large difference. Even though a thinned stand may suffer a higher % loss, it may actually lose fewer trees than an un-thinned stand because it has fewer trees to start. Recently thinned stands have a more irregular crown surface and therefore generate more turbulence in the wind flow. This leads to a higher wind load on individual trees and consequently more swaying. More swaying can lead to more trunk breakage and windthrow. This increased risk will last until the trees in the stand have acclimated to their new spacing. Terminal height may be a concept worth introducing to tree management. Taller trees regardless of age, species, or any other factor, are more susceptible to windthrow, so setting a target terminal height may be a valid strategy. Get Insurance against loss from wind, fire and possibly other threats. Insurance is available from Outdoor Underwriters, Inc. of Columbia SC. The policies come through Lloyd’s of London and each insured property is evaluated based on location, a questionnaire, and assessment of the management plan. As an example, a 54 acre tract in Maine with $25,000 dollars of timber, can be insured against wind and fire for $500/year with a $5000 deductible. Put equipment on site if you know a big storm is coming. Weather forecasting is pretty good, so if you think there will be significant damage and road blockage, then putting machinery at key locations may be a good idea. Winds coming from abnormal directions are particularly damaging. Tree Survival 15 Years after the Ice Storm of January 1998, USFS, Northern Research Station, Research paper NRS-25, February 2014. Shortle, Smith and Dudzik. A mechanistic model for calculating windthrow and stem breakage in Scots pine at stand edge; by H Peltola – ‎1993 – Silva Fennica. 1993, Vol. 27 N20 2: 99-111.
http://www.uky.edu/~jmlhot2/Resources/The%20Practice%20of%20Silviculture-Smith-ch.2.pdf The response of trees to individual thinning and pruning. This Bulletin will be delivered in two parts; Part 1 provides background on stand and tree vulnerability to wind damage, Part 2 will cover management practices to enhance resiliency to wind damage with the goal of stands capable of withstanding 70 MPH wind gusts. Forests are made up of stands that are, in turn, made up of individual trees, and we can think about the topic of building wind resistance at both of these scales. Forest stands can be managed to be windfirm, and the trees within those stands can also be managed to be windfirm. Similar principles apply to resistance against ice/snow damage as well. There are two key areas of wind damage risk in trees: one is the tree’s grip on the ground and the other is tree stem strength. Crown breakage from snow and ice is ugly, but unless the main stem is broken, most trees recover pretty well. In fact, studies show that most hardwoods can lose up to 75% of their crown and recover. Of course, the downside is the increased threat of new internal decay and grade loss. While there are certainly steps you can take to reduce the risk of windthrow, no stands or trees can be reasonably expected to withstand extreme winds over 95 MPH that are produced by derechos (line storms), downbursts (micro & macro), tornadoes and category 2+ hurricanes, regardless of the level of management. The greatest risk may be from derechos, which occur in warm weather along lines of severe thunderstorms that develop in humid air in the boundary between warm and cold air masses. These conditions are becoming more common in the Northeast, resulting in the potential for an increased frequency of derechos. Of course, some trees will withstand extreme winds over 95 MPH, but managing for that level of resistance does not seem reasonable in a forest situation, although it may be a suitable approach in parks. · Beaufort Wind Scale defines hurricanes as having winds over 73 MPH. With an increased risk of strong storm events under future climate scenarios, the important question is: How do we develop stands and trees with sufficiently strong ground grip and stem strength to withstand 70 MPH gusts? These characteristics are known to increase the risk of wind damage, by either blowdown or severe breakage. · Tree height – Taller trees regardless of age, species or any other factor are more susceptible. This is simple physics, a longer lever (height) exerts more force at the fulcrum (root collar). · Stem taper is an indicator of susceptibility. Trees with little taper are more susceptible, particularly small diameter trees. This is about stem strength because thicker stems are stronger. Trees grown in the open, where they are exposed to wind, have very tapered trunks. This makes them windfirm, but they are of little commercial value. The trick is to find the right combination of strength and value. · Height diameter ratio – This relationship is expressed in like units: A 60 feet tall tree that is 10 inches DBH has a ratio of 72; (60X12=720/10=72). Trees with ratios between 60 and 80 tend to be stable, while trees with ratios over 100 are at high risk of damage. · Shallow or restricted roots – Whether caused by thin soil, wet soil or species characteristics, shallow or restricted roots are a disadvantage because they reduce the tree’s grip on the ground. A related characteristic is small root area or lack of spread. In several big storms, poplar seemed particularly vulnerable. The root balls at the bottom of these trees were noticeably smaller than one might expect. Also planted trees whose roots were constrained in the pot may never grow a widely spread root system. · Saturated unfrozen soils are physically weaker so the tree’s grip on the ground is diminished. · Trees weakened by decay. Anytime the roots, trunk or branches have internal decay the structure is weakened and less able to withstand the bending force of wind or ice or snow. · Trees with branching patterns that have proven to be susceptible. These include co-dominant stems and branch joints that include bark in the joint. · Old trees, simply because older trees tend to be taller and have a higher likelihood of decay. · Trees in recently thinned stands. Trees that have grown in fully stocked conditions, supported and constrained by adjacent trees, are susceptible when those adjacent trees are removed. This is a dilemma. Common thought is that it takes about five years for trees to adjust to more open conditions, by expanding their roots, crowns and stem configurations. How trees grow and respond to physical stresses. Understanding how trees respond to physical stress can lead to better management for windfirmness, ice resistance and economic value. To withstand deflecting forces, trees strengthen themselves by adding wood at the points of stress. The well-known phenomena of compression and tension wood in tree stems are exaggerated examples of this growth response. An individual tree will attempt to grow straight and balanced, in order to increase its ability to reproduce and collect carbohydrates from sunlight. This involves focusing wood growth in particular places, such as reinforcement where bending stress occurs. This differentiated growth is driven by auxin, which is the primary plant growth hormone. It originates in the buds and is distributed throughout the tree via a complex transfer system. This additional growth occurs in the parts of the tree that most commonly experience high stress, such as points within the crown where branches move around a lot, the base of the crown where the whole moving crown meets the main trunk, and at the stump were the whole tree meets the root system. Thus, a tree grown in completely open conditions develops a very large crown that can absorb light from all directions and an exaggerated root collar to deal with the bending stress of the large moving crown. Growth is concentrated on crown expansion and stem/root stability, rather than height growth. In contrast, trees grown in tight, fully stocked stands must deal with very different conditions. In this case, there is relatively little stem bending stress, but there is strong vertical competition for light, which results in tall, relatively thin trees. Understanding these growth patterns can be used to increase both the windfirmness and economic value of trees. These will be explored in Part 2 next month. · Tree Survival 15 Years after the Ice Storm of January 1998, USFS, Northern Research Station, Research paper NRS-25, February 2014. Shortle, Smith and Dudzik. · A mechanistic model for calculating windthrow and stem breakage in Scots pine at stand edge; by H Peltola – ‎1993 – Silva Fennica. 1993, Vol. 27 N20 2: 99-111. · http://www.uky.edu/~jmlhot2/Resources/The%20Practice%20of%20Silviculture-Smith-ch.2.pdf The response of trees to individual thinning and pruning. The August 2014 Climate Smart Land Network Bulletin provided an introduction to stream crossings and climate change. The September Bulletin provides additional detail on using watershed and stream corridor characteristics to design and size stream crossings that perform well in a changing climate. Stream crossings that maintain the slope, structure and dimensions of the natural streambed are proving to be robust in large flood events and have the added benefit of maintaining full ecological function and connectivity of streams. 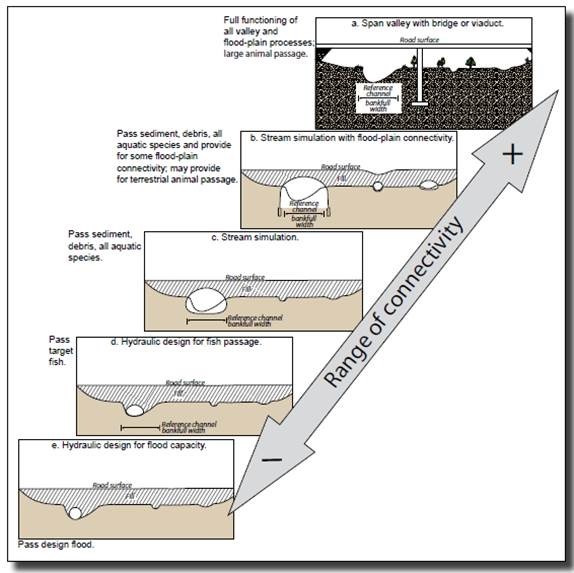 Figure 1 shows a hierarchy of stream connectivity that occurs as increasingly large portion of the stream channel and surrounding floodplain are spanned by a crossing.1 Moving up this hierarchy also increases the size of storm event that can be accommodated without damage to the structure. Stream channels are a manifestation of the water flow volumes and frequencies in the surrounding watershed. Identification of the normal high water mark provides a reference for identifying the minimum opening size needed to accommodate a given design storm. The normal high water mark is evidence of a frequent surface water elevation below bankfull that can usually be identified by physical scarring along the bank. Bankfull is typically defined as the point at which the stream channel transitions into the floodplain. Indicators of normal high water may include erosion, shelving, changes in soil characteristics, destruction of terrestrial vegetation, the presence of litter or debris, or other distinctive physical characteristics.1 The 10-year peak is approximately 2.5 times larger than the normal high water flow, the 25 year is approximately 3.5 times larger and the 50 year peak is approximately 4.5 times larger. The first step in determining the opening size needed to accommodate a selected design storm is calculating the area of the stream bed (stream width in feet at the normal high water mark X average depth in feet). Multiply the area by 2.5 if the goal is to accommodate a 10-year storm, 3.5 if the goal is to accommodate a 25 year storm, and 4.5 if the goal is to accommodate a 50-year storm. This calculation will result in the opening size in square feet. If a culvert is to be used for the crossing it can be selected from the chart below. Note that if peak flows increase to 15% larger than historic norms going up one culvert size will address that. Embedding a culvert to match stream elevation and allow for inclusion of natural substrate may reduce volume by up to 35% and require sizing up to maintain desired flow capacity. The green section of the chart highlights the most commonly used culvert sizes. For opening sizes above 20 square feet structures other than culverts are typically used. If a pipe arch is to be used, double the opening size from the previous calculation and select the corresponding diameter from the chart. As precipitation patterns continue to change in response to a warming climate stream crossings will be subjected to an increase in heavy downpours. The linkage between the increase in heavy downpours and flooding will be most direct in those watersheds that are vulnerable to flash flooding. Taking the regional trends in both extreme and total precipitation into account in designing and installing crossings will minimize the likelihood of having to spend time and money repairing or replacing the structures. The USGS StreamStats Program (http://water.usgs.gov/osw/streamstats/) provides a GIS-based interface to stream gage data and includes tools to estimate flows at non-gaged locations. · Use substrate in the crossing that matches upstream and downstream reaches. Installing crossings that maintain stream width and substrate may require openings that are larger than the size needed to handle stream volume. An 18” culvert may handle the estimate water flow, but to maintain stream width it might take a 24” culvert. For this reason many crossings are now being installed as arches or bridges, because they are less expensive and easier to install than huge culverts. Building crossings that meet these additional considerations normally result in openings that meet the 50 or more year peak flow estimates. 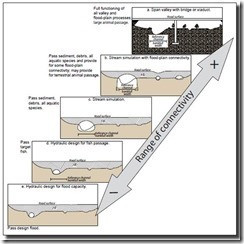 Recommendations for Permanent Crossings: Calculate the area of the stream bed as previously described. Multiple by 3.5 to calculate the minimum opening size needed to accommodate a 25-year storm. Increase the structure opening size as needed to ensure that the bankfull width of the stream channel is spanned.1 Install a structure that maintains stream width, slope and substrate and you will have a crossing that will likely withstand all but the most extreme flows. Note on Regulatory Compliance: Regulatory requirements for stream crossings vary by location and are beyond the scope of this Bulletin. Please be sure you are familiar with the regulatory requirements for the location where you are working. 2. Wilkerson, E. & Gunn, J. Quantifying Benefits and Costs of Applying Improved Forest Management Practices for Protecting Water Quality in the Northeast U.S. (Manomet Center for Conservation Sciences, 2012). 3. Blinn, C., Dahlman, R., Hislop, L. & Thompson, M. Temporary Stream and Wetland Crossing Options for Forest Management. (U.D. Forest Service, North Central Research Station, 1998). The USDA Soil Conservation Service (SCS) Methods; specifically: “Urban Hydrology for Small Watersheds,” June 1986 Soil Conservation Service Technical Release #55. The United States Geological Survey (USGS) Methods; specifically: U.S. Geological Survey. 1975. “A Technique for Estimating the Magnitude and Frequency of Floods in Maine.” Open- file Report 75-292. Several aspects of climate change should be considered in the design and construction of stream crossings for forest access. These factors include both the need to plan for resilient structures against the backdrop of continued change in precipitation patterns and the need to minimize fragmentation of streams as climate warms and aquatic species move in search of suitable habitat. As the atmosphere warms an increasing percentage of precipitation is coming in heavy precipitation events. Warming ocean temperatures provide a conducive environment for larger, more powerful coastal storms. Both of these trends are increasing the potential for extreme precipitation events that can increase erosion and sedimentation and damage improperly designed stream crossings. Stream crossings can play a significant role in limiting movement of fish and other aquatic species along stream corridors if not properly designed. As stream temperatures warm the opportunity for cold water fish to move to refuge areas with sufficiently cool waters is increasingly important to their viability. Emerging approaches to linking infrastructure and ecological resiliency through the design of structures that take stream function and form into account hold the promise of simultaneously addressing both changing precipitation patterns and ecosystem stressors. Precipitation patterns are changing as the climate warms. The warming of the atmosphere and the oceans have combined impacts that are causing long term changes in both global precipitation intensity and regional precipitation totals. As the atmosphere warms it can hold more water vapor (7% increase for every 1 degree C increase in atmospheric temperature).1 This is a key factor in the global increase in the percentage of precipitation coming in heavy precipitation events. As the climate continues to warm this trend is projected to continue with a diminishment in light and moderate precipitation and continued increase in heavy precipitation. As the atmosphere warms evaporation rates are increasing. In geographic areas with ample surface water this leads to increasingly high levels of water vapor in the atmosphere. In areas with limited surface water this phenomenon can exacerbate drought.1 In a general sense wet regions of the planet are getting wetter and dry regions are getting dryer. As sea surface temperatures warm evaporation rates are increasing. As sea surface temperatures warm more energy is available to fuel tropical storms, hurricanes and extra-tropical coastal storms. This trend is creating background conditions that are conducive for larger, more powerful storms with both stronger winds and more precipitation.2 The influence of climate change on the frequency of ocean storms is uncertain leading to differing projections of future storm frequency. 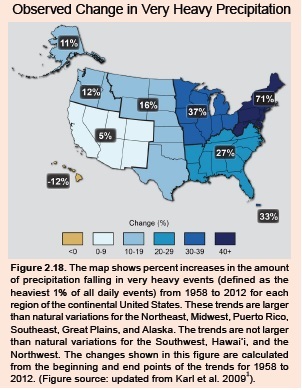 As a result of these trends, the percentage of total precipitation coming in heavy precipitation events is increasing across all of the U.S. and Canada. 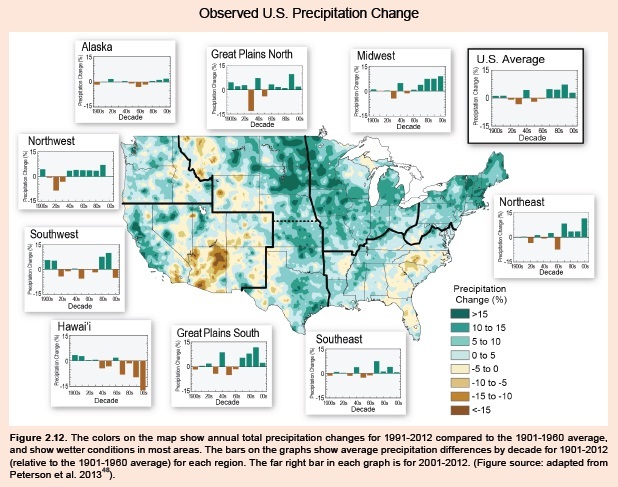 Total annual precipitation is also changing with some regions such as the northeastern U.S. and Canada getting more total precipitation over time and other regions such as the southwestern U.S. receiving less. These long-term, climate change-driven trends in precipitation interact with cyclical phenomenon such as the El Nino/Southern Oscillation and the Atlantic Multi-decadal Oscillation. Depending on the phase of these cyclical patterns they can enhance or retard the precipitation changes associated with longer-term climate trends. Statistical analysis of regionally-specific precipitation rates and frequencies provides an important benchmark for sizing of stream crossings. However, as climate continues to warm it is likely that historic statistics will become a less reliable predictor of future precipitation patterns. Two of the primary sources of precipitation frequency data for the U.S. are Technical Paper No. 40: Rainfall Frequency Atlas of the United States, 1961 (http://www.nws.noaa.gov/oh/hdsc/PF_documents/TechnicalPaper_No40.pdf) and the NOAA Precipitation Frequency Data Server (http://dipper.nws.noaa.gov/hdsc/pfds/). Both of these sources are based on the notion of a static climate. The NOAA Precipitation Frequency Data Server is intended as an update to Technical Paper 40 but due to funding limitations the project has not been completed for all of the U.S. To address this gap and provide insight on changes in extreme precipitation, the Northeast Regional Climate Center created a web-based tool titled Extreme Precipitation in New York and New England (http://precip.eas.cornell.edu/). These more recent data indicate that what was considered a 100-year storm event in the northeast in 1950 is now likely to occur twice as often. Watershed conditions such as soil moisture, topography and ground cover determine how a given watershed responds to changing precipitation inputs. It is important to differentiate between watersheds that are vulnerable to flash floods and those that are not. Watersheds that are conducive to flash flood events due to steep slopes and stream channels that rapidly concentrate flow are exhibiting increases in flooding as climate warms and heavy downpours become more prevalent. Flood vulnerability in watersheds that are less conducive to flash floods is dependent on precursor conditions such as soil moisture, snow pack and ground cover. 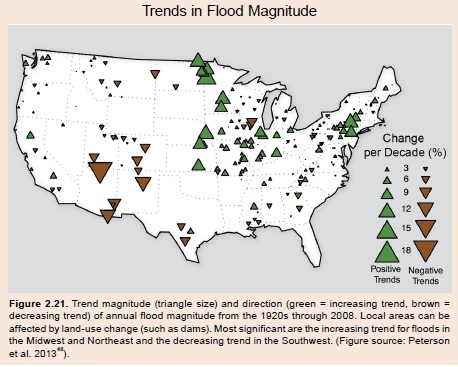 Trends in flood magnitude differ by region with generally increasing trends in the Northeast and Midwest and decreasing trends in the southwest.3 Significant variation in flood trends occurs within regions based on differing watershed characteristics and differing local precipitation patterns. Inclusion of these elements in stream crossing design will often result in a wider opening width than would be selected based purely on hydrologic concerns and will bias selection towards the use of open-bottom structures such as pipe arches or bridges as opposed to culverts. Both of these decisions often have the added benefit of resulting in a structures that will accommodate a larger design storm. Minimize the number of new stream crossings: Planning road and trail systems to minimize the number of new stream crossings is a sure-fire method of reducing cost and risk. Use of temporary structures where feasible: Temporary stream crossings reduce exposure to flooding due to the limited time that they are in place and completely eliminate long-term maintenance headaches and long-term stream impacts. In addition, some states offer loaner bridges and cost share programs. Link infrastructure and ecosystem resiliency in design and construction: Designing new structures and upgrading old structures to address both changing precipitation patterns and ecosystem function will minimize failure of structures and the need to rebuild prematurely. 3. Peterson, T. Monitoring and understanding changes in heatwaves, cold waves, floods and droughts in the United States: State of knowledge. Bull. Am. Meteorology Soc. 94, 821–834 (2013).